A new book about the Thompson submachine gun has been published. It is titled, Great Britain – The Tommy Gun Story. It is the authoritative story of the Thompson gun in Great Britain during World War II. The author is Tom Davis, Jr., one of the “other authors” of The Ultimate Thompson Book by Tracie Hill. Great Britain - The Tommy Gun Story is cited as Recommended Reading in Frank Iannamico’s new Thompson book, American Thunder III. Tom is also a free-lance writer of stories about the Thompson gun, many of which have been published in Small Arms Review magazine. 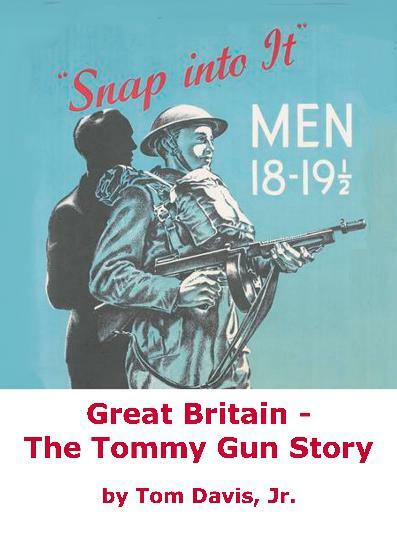 Aside from all the new information about the Tommy Gun in Great Britain, new and old members of the Thompson community will find the chapter with many detailed pictures of the famed Thompson guns an invaluable reference. The below link will take you to Tom’s website where you can read more about this new and exciting book and order a copy for your library. Great shipping rates are available for the United States, Great Britain, Europe and all worldwide destinations. Bump back to the top. This makes an excellent gift for that Thompson enthusiast that has, wants or needs everything Thompson! Another bump to the top! I am going to bring this back to the top again. For those looking for a Thompson gift for that special someone, this is a must have book for your reference library. I noticed Amazon.com has some great Christmas pricing, including a "Look Inside" view that lets customers see and read some of the pages. Shipping is reasonably priced and delivery can be made prior to Christmas. I have included the link below and encourage everyone to take a look. Merry Christmas and Happy New Years to all. This is going to be a great Class 3 year! I am going to bring this back to the top for the Thompson enthusiasts that are new to Sturmgewehr.com. The above link for Amazon.com is still active with some great pricing options. I can also personalize a copy and ship to your front door. Send me a message via this forum. Every passage in the book is supported by a document written long ago, a recorded meeting, or some other type of irrefutable proof. There are 358 footnotes to aide the reader with the source documentation. You will find a documented history of the Thompson gun in Great Britain that is much more complete and different from previously published sources.